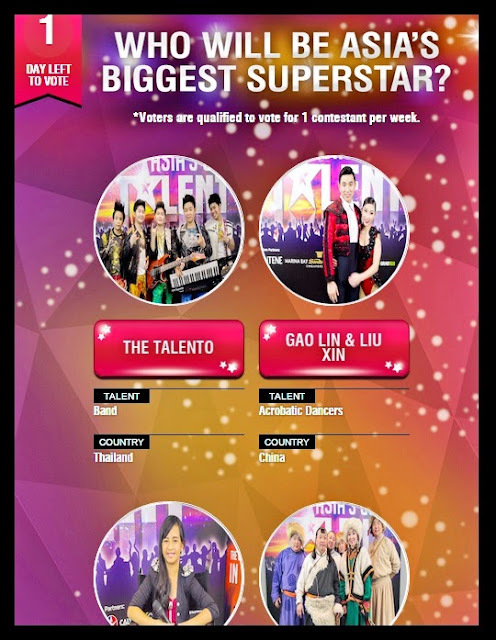 Viewers can vote for their favorite acts in one of three ways: SMS, Facebook and the “Asia’s Got Talent” mobile app that can be downloaded from Google Play Store and Apple Store. For SMS, text SMS AGT(Contestant number) to 2929 (only in the Philippines). This service only supports Smart and Globe. Charges will be applied to customer’s mobile. Voting opens after the broadcast of the grand finale performance episode and will remain open for four days. Voting will be closed on May 11, 11:59 pm, Monday.